When Will I Get My CD Labels? 4,000 and under CD Labels: Ships or ready for pick up in 2 business days from proof approval. Over 4,000 CD Labels: Ships or ready for pick up in 5 business days from proof approval. CD label printing with real sticking power! Print full color CD labels with 48HourPrint.com and we think you'll be stuck on us! You get the benefits of high quality CD label printing at prices you can really afford. Our CD label printing services are also backed by our industry-leading turnaround guarantee. Enjoy our 48 Hour Turnaround Time Guarantee on quantities of CD labels up to 4,000. Your CD will be identified quickly with a full-color CD label that reflects your CD's packaging. 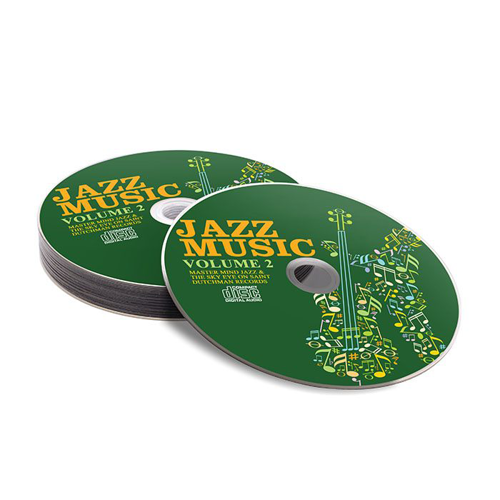 Incorporate key visuals, colors and messaging into your CD label printing for a unified image. And you can complete your entire CD package with other CD printing products from 48HourPrint.com. In addition to CD label printing, we also offer CD cover printing, CD booklet printing, CD tray card printing, and CD Wallet printing. CD labels are printed on 60# uncoated adhesive stock or 60# high gloss laser stock with a permanent adhesive backing. Check out our CD product templates for layout guidelines that will help keep your print job on schedule.